It's relatively simple and rewarding to take steps to create order and space in your home. 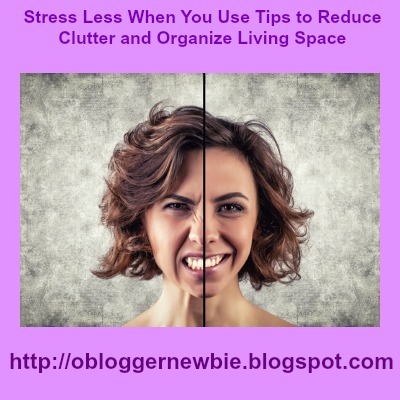 I’ll offer tips to help you organize mail, magazines, newspapers and overflowing closets or shelves. The worthwhile ideas below provide motivation and methods to help you arrange and streamline possessions. You’ll be better able to spot what you’re looking for quickly, get more done in less time, and reserve precious hours for what you really want to do. 1. Start with one task at a time. 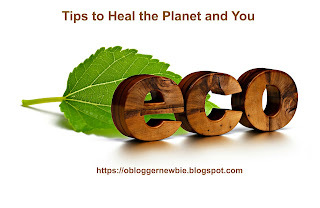 According to Cynthia Townley Ewer, the editor of Organized Home dot com, "Start slow, small and steady. Just as clutter arises gradually, over time, so it must be fought gradually over time." Schedule fifteen minute cleaning sessions and reward yourself when done. Files overflowing? Tackle them by using the same technique Townley Ewer suggests above. Weed out those folders you no longer need, combine those you can, and leave those that work as is. 2. Make your bed early in the day every day. You'd be surprised how quickly this helps dress up your bedroom. Doing this one small thing gives you a sense of accomplishment, and encourages you to tackle the next "easy" decluttering project revealed below. 3. Put important items in a designated place. Install a key rack near your front door or in the kitchen. As soon as you come in, hook keys there mindfully. Place an eye glass case and glasses in the same drawer every day, and arrange medications on a tray in your kitchen or bath. Consciousness and control walk hand in hand. 4.Purchase closet, shelf, and drawer organizers. Devise a clothing storage system that works for you. If you haven't used items of clothing or furnishings in one year, it's a safe bet that you can sell, donate, or recycle them. 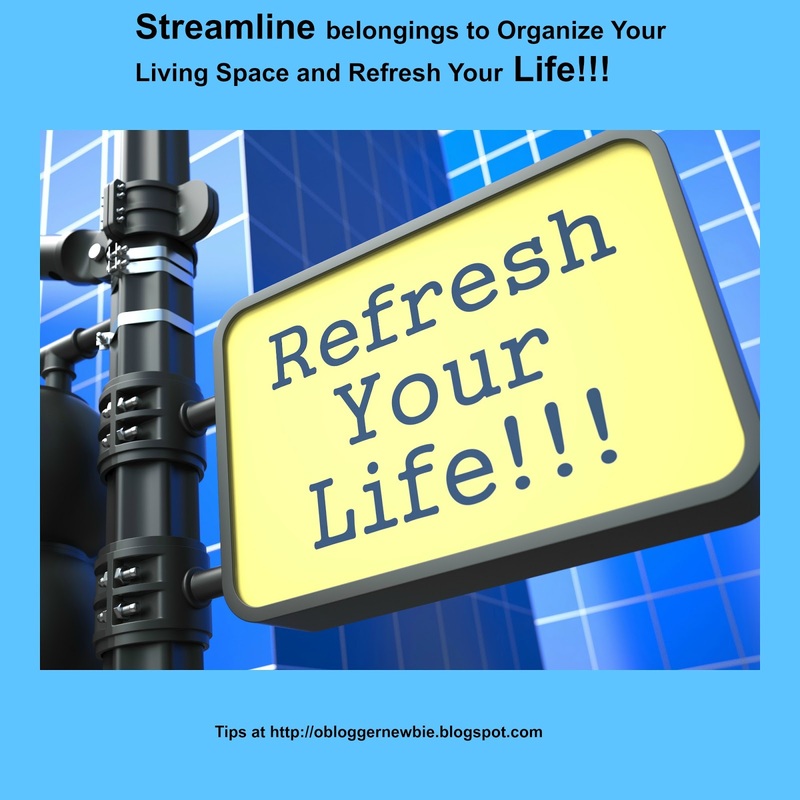 Feng Shui principals teach not to hold on to anything unless you love it. Save only those things you thoroughly enjoy. 5. Make a grocery shopping list and stick to it. You'll soon see that you save money, can easily find items in your pantry, save time, and reduce overall stress. 6. Prevent overwhelm before it begins. Are you financially overextended, because you collect or hoard stuff? It's up to you to choose to simplify spending, live within your means, and reduce the amount of financial responsibilities you take on so you'll sleep better at night. If you don’t know how to or can’t do this alone, ask for help from a financial planner, organizational expert, or therapist. 7. Reflect on your attitudes, beliefs, and assumptions. The National Association of Professional Organizers recommends you sort mail and bills as they come in. Clutter makers like newspapers, magazines, and books need to be recycled or donated on a regular basis too. A good rule of thumb to prevent reading matter pile up is to donate, share, or recycle what you’ve finished reading every week. Which Would You Rather Create? 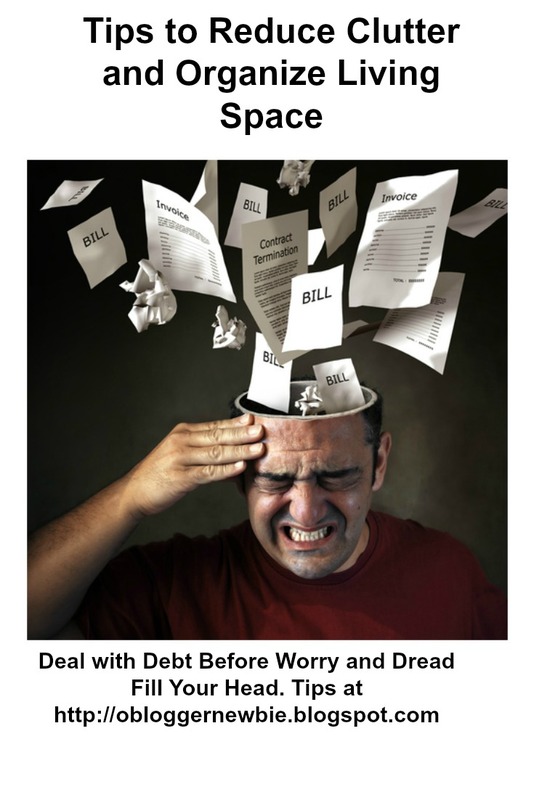 Stress or No Stress? 8. Devote a few minutes at the beginning or end of your day to tidy-up. Wash dishes, discard garbage, and put away out of place clothing, towels, and odds and ends. Don’t put off tasks. Motivate yourself by affirming it's easy to get off to a fresh start each morning, when there's less mess from the night before. Use early morning to meditate and reflect. Envision yourself accomplishing goals, having fun during the day, and relaxing or living it up in the evening. 9. Acknowledge you are deserving of thriving in pleasant surroundings. What small steps can you take to accomplish this in the next fifteen minutes? Then go for it! 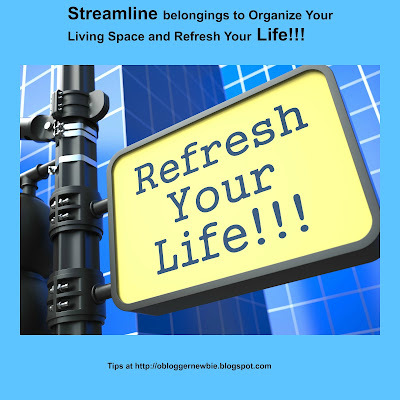 For more see 3-Secrets-to-Help-Clutter-Proof-Your-Home and Reduce-Clutter-to-Create-Tranquility-at-Home. For more see Goodreads Page on Clutter Quotes. Before you go please comment. Let us know which tips you can or do use and which ones you resist doing. Do you have ideas I didn't mention that you'd like to share with us? Scroll down, enter your comment, and then click publish. Thanks for visiting. Wishing you a clutter-free day! 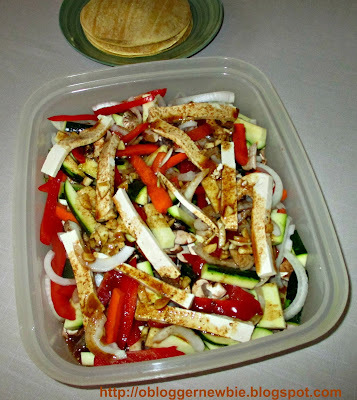 Multigrain Tortilla Stuffed with Marinated Fajitas Mixture. Guacamole, Salsa, and Corn Chips too. Whether you’re hunting for a flavorful recipe for Meatless Monday or Tex-Mex inspired theme for Cinco de Mayo or Mother's Day, consider serving this recipe. Perhaps you're hankering for a vegetarian brunch or dinner entrée that’s fun and healthy to eat any day of the week. Look no further. 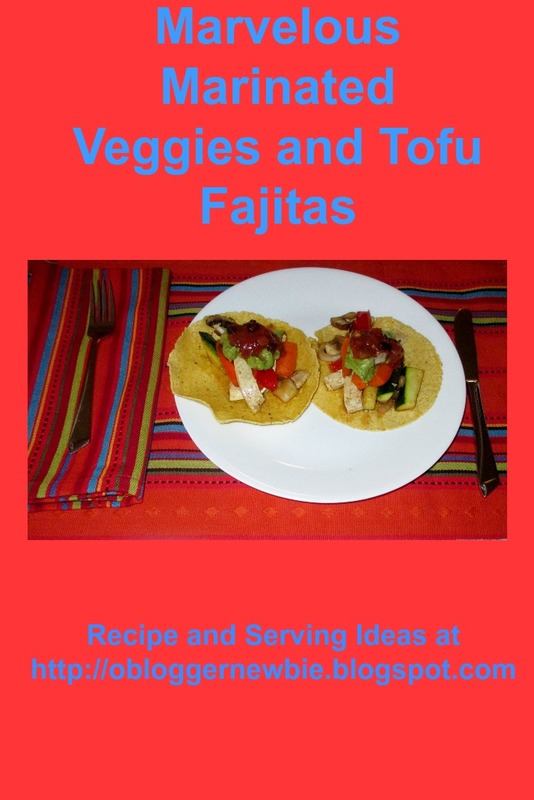 Serve versatile marinated veggies and tofu fajitas. Bold on taste, easy to prepare, and health benefits galore! Serve this dish once and your family will clamor for more. Prep 10 minutes. 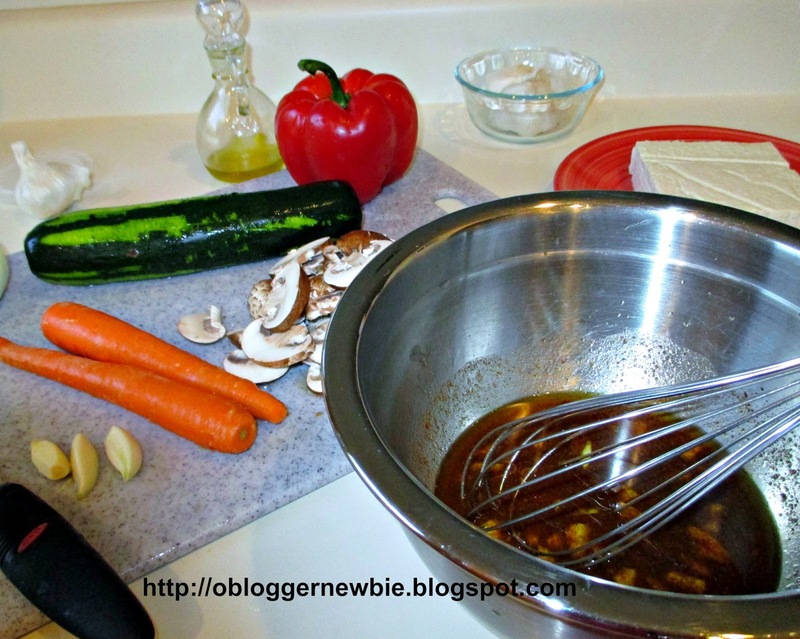 This marinade works well for Fajitas, Tacos, Enchiladas, or Burritos. Prep 10 minutes. Make each strip bite sized. I use organic ingredients when available, because organic means nutrient content is higher and produce is not genetically modified, not sprayed with chemicals, and is not grown in soil that contains chemical fertilizers. 1. Whisk the first 6 ingredients for the marinade- chili powder, cumin, dried oregano, cayenne pepper, paprika, and onion powder in a small bowl. I took an easy way out and used a ready mixed Mexican Seasoning instead. Add other marinade ingredients and whisk again. Then set it aside. 2. 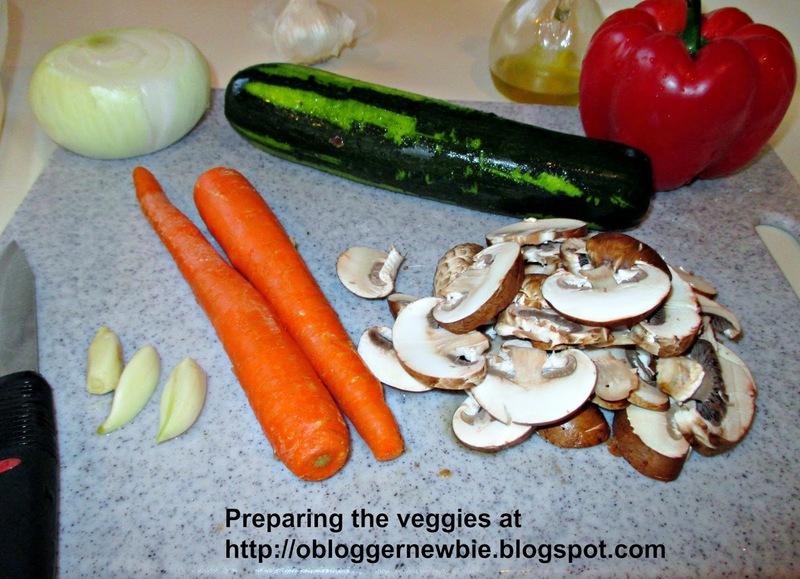 Prep and prepare onion, carrots, zucchini, mushrooms, and tofu as described above. Place in a large storage container, pour on marinade, cover and refrigerate. See Simple Way to Drain Packaged Tofu and Tofu Recipe Ideas. 3. Marinate for at least 20 minutes or even up to 12 hours. The longer you let the flavors meld, the bolder the taste. 4. About 10 min. before you’re ready to serve it, heat 1 extra tablespoon of extra virgin olive oil in a cast-iron grill pan or frying pan over medium-high heat. Add marinated tofu and veggies, and cook until veggies are as soft as you like them and tofu turns light brown. 5. At the same time, warm tortillas in the oven at 325 degrees Fahrenheit or in a cast iron pan on top of the stove at medium heat. 6. 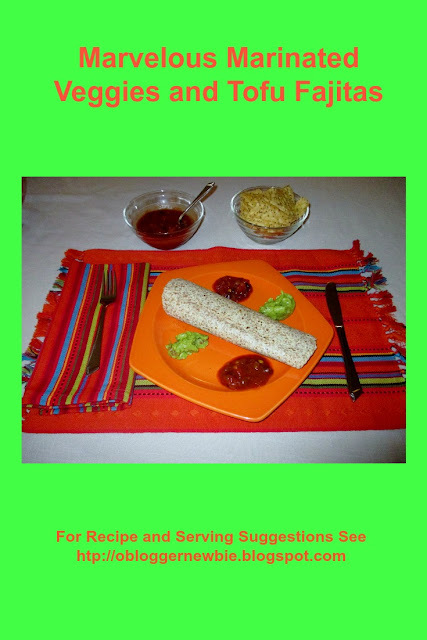 Serve stuffed, wrapped fajitas with brown rice and beans. If you’d prefer, serve fajitas with a side salad, corn chips, soup, or other appetizer. Any way you serve it, the recipe ingredients are economical. The components are loaded with plant-based protein, fiber, antioxidants, vitamins, and minerals, yet are cholesterol free. Season dish to taste with salt and freshly ground black pepper. Serve this colorful array of plant-based goodness to family or friends often. It's a meal they will love. Happy May. Before you go, take a moment to comment. Do you enjoy eating Fajitas and other south of the border fare? What are the reasons you cook most meals at home, get take-out, or eat a lot of your meals in restaurants? Please offer feedback in the space provided below. That way I'll know this post is being seen and enjoyed by you.